Andrew de Vos van Steenwijk is the CEO of Lazer Helmets and he brought some Superskin and other Lazer helmets to see about finding U.S. distributors for this renaissance brand. 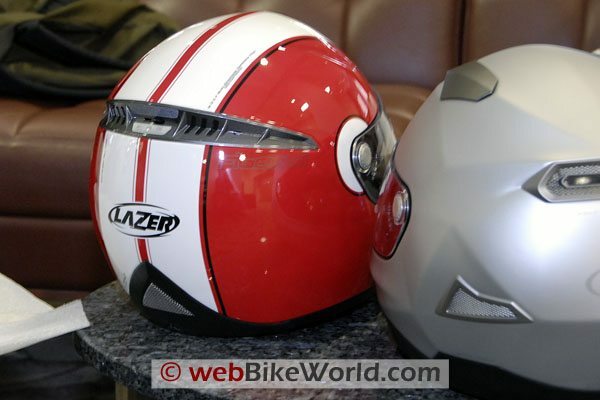 The Lazer Superskin helmet was described in this webBikeWorld article last week, and I can say that the real thing is quite interesting. The “skin” is stiffer than you might think. It was developed by Bayer in Switzerland and was tested in the UK’s Transport Research lab using ECE equipment. I’ve added a short video on our Superskin page showing Andrew “squeezing” the Superskin on the helmet. Some readers asked about the consequences of having a stone hit the helmet or if the Superskin helmet was inadvertently dropped. All I can say after seeing it is “no worries”. A “normal” helmet, if dropped, may crack and I see no difference in the Superskin helmet. The same care should be taken and as far as I can tell, if the helmet was damaged enough to compromise the Superskin, a normal helmet would also have been shattered. The skin is very tough. 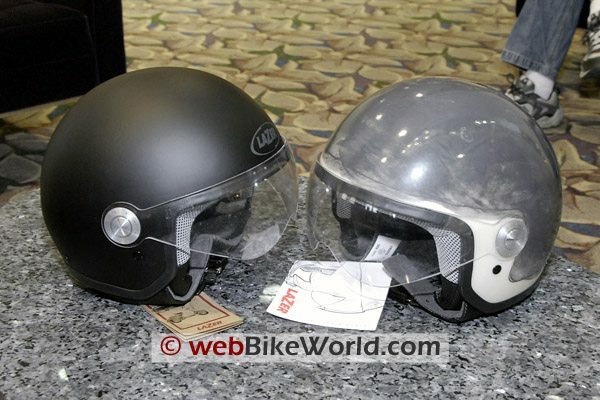 Lazer Helmets is also undergoing a design evolution, and the Lazer Kite helmet is a very cool-looking angular helmet to match current motorcycle styling trends. The angles are molded into the shell, a first. By the way, Lazer is also known for a couple of other innovations. The helmets have a unique face shield visor system, which allows the visor to seal tight against the eye port gasket. The rotating mechanism on the side is made from a solid block of aluminum, and Alexander said all of the visors are interchangeable across all of the same type Lazer helmets, as are the liners! 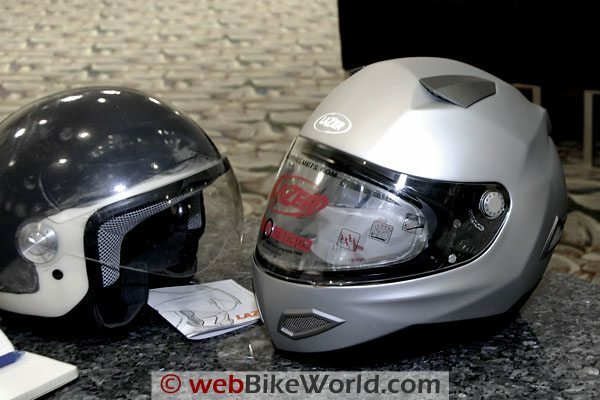 The helmets also have a special brow reinforcement band under the shell to increase protection. The Lazer Superskin, painted (left) and “raw” on the right. 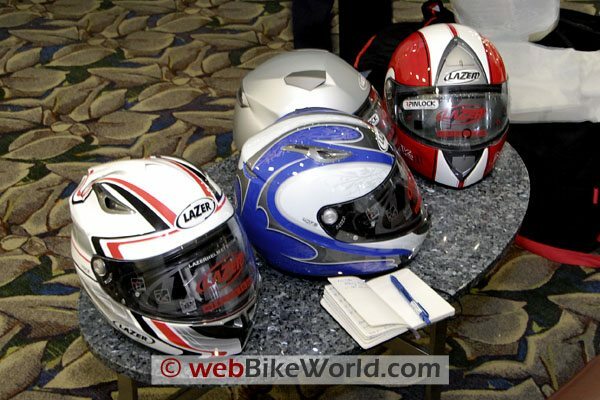 A gaggle of Lazer helmets. Lazer Helmets, rear view, with the Kite on the right. Brembo leverages the opportunities at the annual Powersports Dealer Expo to make new product announcements, and they are always kind enough to give us photos and information on the new goodies. 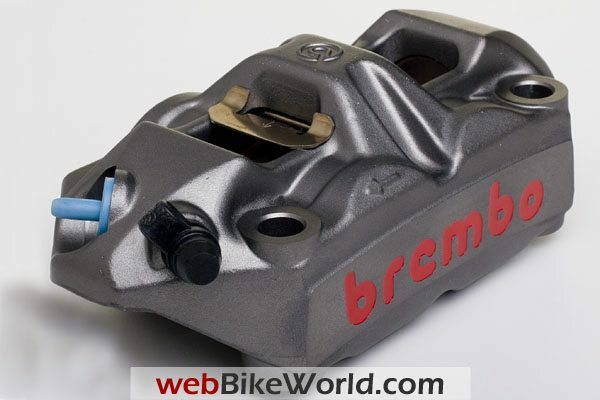 This year, Brembo is releasing a new master cylinder brake system for unfaired bikes, along with accessories for some of their previous brake systems. Also, check out the cool nickel-coated brake caliper, all in this special one-page Brembo 2009 report in our Motorcycle News section.